This stylish plant, originating in South East Asia, displays multiple flower heads which resemble moths or butterflies. They thrive in bright indirect light and temperatures that are warm by day, cool at night. The long-lasting blooms add an exotic touch wherever they are displayed and the plants are easily maintained. The Phalaenopsis Orchid makes an instant impact and is a great way for you to show a loved one you care. All of our plants will be supplied in bud/starting to flower, heights and colours will vary from batch to batch and season to season, but all will have a minimum of one up to three strong stems of blooms on each plant and be beautiful. Keep in a bright location and the flowers will last for weeks. Colours supplied may vary slightly according to availability. 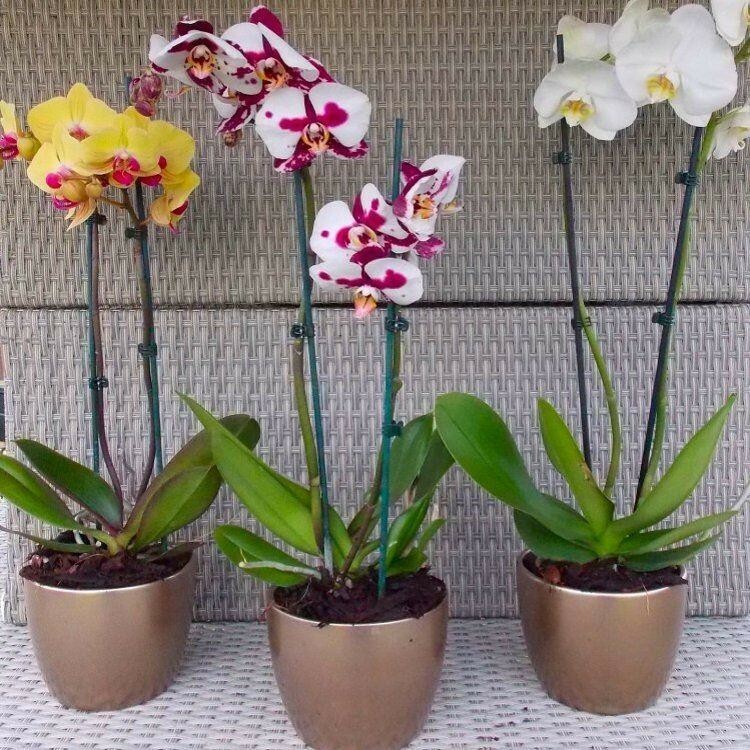 Pack of THREE PLANTS supplied complete with Gold Pots - Typical examples as supplied pictured.